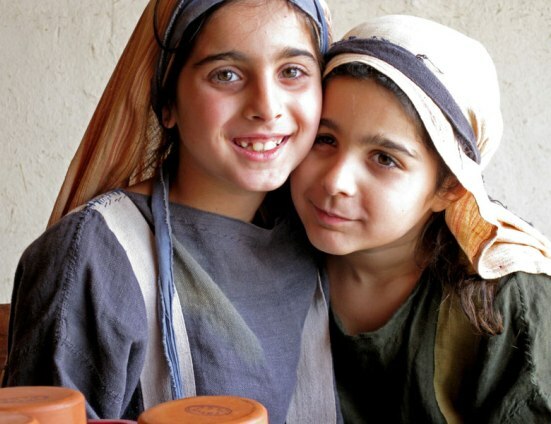 MARTHA & MARY, two sisters who sheltereded Jesus. Lazarus raised. 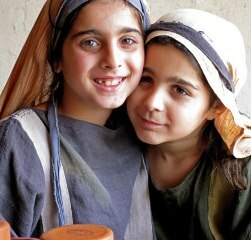 Martha and Mary were two sisters who offered hospitality to Jesus and the people traveling with him. They had a brother, Lazarus. The three young people were friends of Jesus. They behaved with him in a natural way, speaking openly about what they thought. Jesus, who was quite capable of overwhelming people with his presence, was informal and easy in their company. This was important for a man like Jesus. People who are held in high esteem, as Jesus was, are often isolated, even though they are at the center of the crowd. Leonardo da Vinci captures this isolation in his painting of The Last Supper (below): Jesus is sitting in the middle of a table with his friends all around him, but he seems alone, as those dearest to him lean away from him, separating themselves from him as they will do later, when he is arrested and faces death. 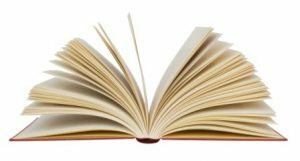 Who were Martha and Mary? We know little about the background of Martha, Mary and Lazarus. They may have been well-to-do orphans who had the management of their own lives, since there is no mention of their parents. Moreover the eldest of the three, Martha, appeared to be in control of the household. They seemed to be affluent. 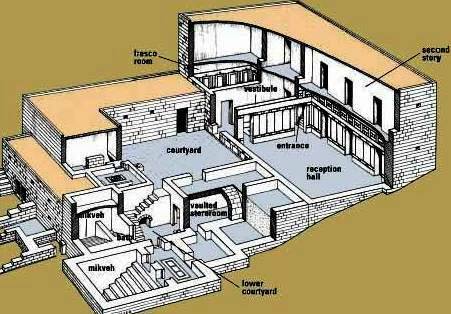 They had a house large enough to accommodate many people, as their hospitality to Jesus and his group of friends shows. They appeared to have no occupation. 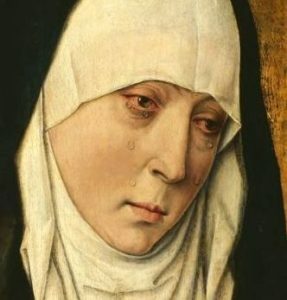 But Mary could afford to buy a very expensive perfume called nard. It was a special gift, not an everyday item, but it showed they were people of means. None of the three appeared to be married. This was unusual in Jewish society, where people were usually married before the age of 20. It may mean that they were quite young, perhaps still in their teens, or that they were on the edge of society, and not acceptable in some way. In any case, they seem to have been young, comparatively well-off, independent, and intelligent. The first story about them happened in a town near Jericho, which is between Galilee, where Jesus came from, and Jerusalem, where he died. Jesus visited their house. Martha prepared food for the guests; Mary sat and listened to Jesus. ‘Now as they went on their way, he entered a certain village, where a woman named Martha welcomed him into her home. She had a sister named Mary, who sat at the Lord’s feet and listened to what he was saying. The two women obviously had complementary personalities – this is common in families. Martha was a doer, a capable young woman who organized and ran a fairly large household. Mary was a thinker, interested in ideas. Martha objected to the fact that she had to work while Mary sat and listened. Jesus said that Mary had made the better choice. What’s the meaning of this story? Mary ‘sat and listened’. This was the usual posture of a disciple of any teacher in the ancient world. But disciples were usually male, so Mary must have been quietly breaking the rule that reserved study for males, not females. Her sister Martha was not merely asking for help. She was demanding that Mary keep to the traditional way of behaving. Jesus was ignoring the traditional role of women, and encouraging Mary to think and learn. He upheld her right to listen, think about ideas, and to develop her mind. She should not be limited to the tasks that society laid down for her, but be allowed access to ideas, as Jewish men were. Jesus had previously encouraged the idea of service among his followers, so he did not say that Martha’s role of service was unimportant. This would have gone against all his other teaching. What he did say was that being a disciple, and learning about the ideas he was explaining, was even more important. Lazarus dies. Martha & Mary turn to Jesus. 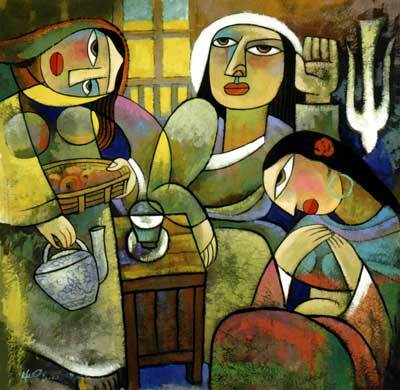 Jesus with Martha and Mary, Bible women. Painting by He Qi. A second story about Martha and Mary happened in the town of Bethany, a small town near Jerusalem but separated from it by the Kidron Valley (see map of Jesus’ visits to Jerusalem). It was about three kilometers east of the city, a comfortable walk for people at that time. Lazarus was very ill, so Martha and Mary sent a message to Jesus, asking him to come. Jesus received the message, but put off coming for two days. In the meantime, Lazarus died of his illness. The house went into mourning. As was the custom, a continual stream of friends and relatives came to comfort Martha and Mary, and to mourn for Lazarus. they did not wash themselves or their clothes, or do any work. What happened when Jesus arrived? 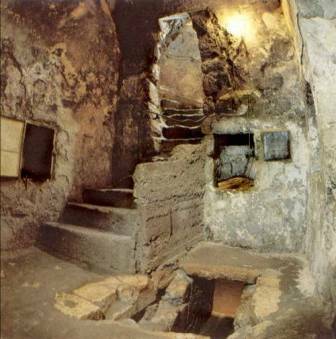 When Jesus eventually arrived, Lazarus had already been buried in the tomb for four days. The length of time, four days, is important. It means that the custom of inspecting the body three days after burial, to make sure that the person was dead, had already been carried out. 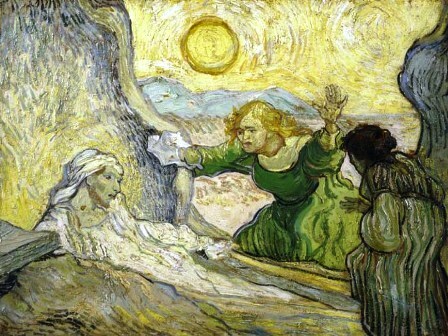 So Lazarus was not merely unconscious, as modern skeptics suggest. This point is driven home by Martha in verse 39, when she described the stench of the rotting body. As Jesus approached, Martha went out to meet him on the road. She reproached him for being so long in coming. ‘When Martha heard that Jesus was coming, she went and met him, while Mary stayed at home. Martha said to Jesus “Lord, if you had been here, my brother would not have died. But even now I know that God will give you whatever you ask of him”. Jesus said to her “Your brother will rise again”. Martha said to him “I know he will rise again in the resurrection on the last day”. Distraught, Martha reproached Jesus for being absent when he was needed. Modern interpretations of the New Testament assume that women at that time were down-trodden and docile, but there is no sign of it in this story. But then as Martha continued talking, she named Jesus as the Messiah and Son of God. This is the central moment of the story. Martha said the same words that the apostle Peter said in Mark 8:29. On the strength of these words, Peter went on to become the first leader of the Christian community. The writer of John’s gospel suggests that Martha had an equal right to authority, because she had an equal understanding of who Jesus was. Why is this story so important? John inserted the story into his gospel to stifle the argument that was raging in the Christian community. Since the day of Pentecost, when the Christian church began, women had been acting as deacons, preaching about Jesus and presiding over eucharistic meals. But opposition had arisen because this did not mirror the position that women held in society at the time. By telling the stories about Martha and Mary, John showed that Jesus treated women as the equal of men, and implied that Christian practice should do the same. After speaking with Jesus, Martha called Mary. Mary ran to Jesus, weeping with terrible grief, and Jesus was deeply upset by the sight of her pain. Jesus went to the tomb, had the stone taken away from its entrance, prayed, and then called loudly to Lazarus. 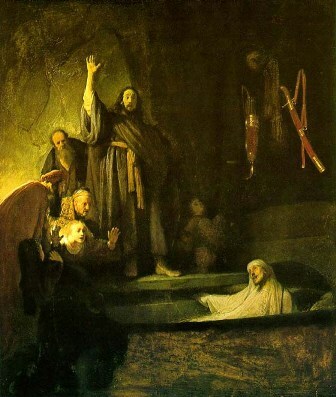 Lazarus appeared, alive, still wrapped in the linen strips of cloth used to cover his corpse. Many Jews believed in Jesus after witnessing this event. Note: The term ‘the Jews’ is used in several ways in the gospels. In the story you have just read, John meant ‘the Jewish friends and relatives of the family’. Remember that Jesus and the people he knew were Jewish. At other times, when John spoke of ‘the Jews’, he meant any people with closed minds. People like this can be found anywhere. John was writing for a community of Jews who had moved away from traditional Judaism, so his portrayal of traditional Jews often reflected the dislike this breakaway community felt for those who did not share their faith in Jesus. In the last year of his ministry, Jesus again visited his friends at Bethany, just prior to going into Jerusalem for the feast of the Passover. 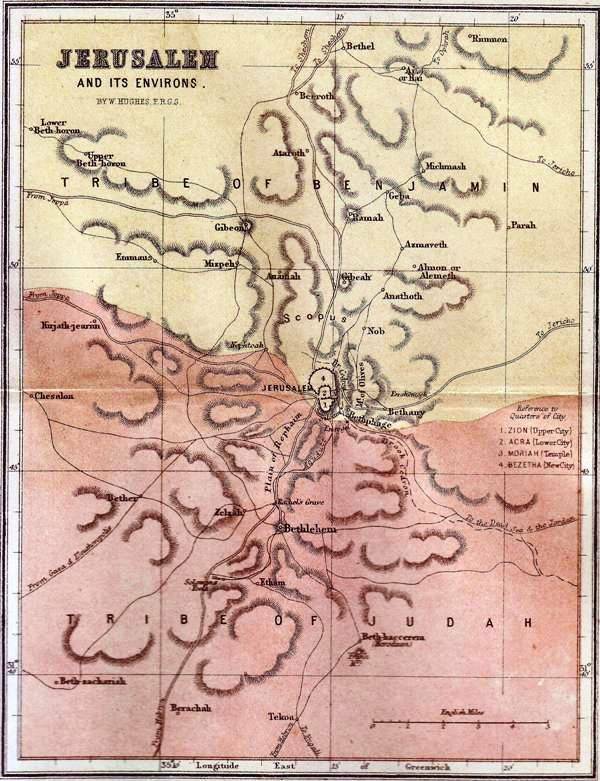 A topographic map of Jerusalem and the surrounding countryside, showing the valley and hillside that Jesus would have traversed on his way south-eastwards from Jerusalem to Bethany. Go to MAPS to see Jerusalem and Judea at the time of Jesus. This was the week before his death. All his friends knew that Jesus was in grave danger. They did not want him to go anywhere near Jerusalem (see John 11:8 and 11:16). The house at Bethany was a safe place, a refuge. Martha, Mary and Lazarus gave a dinner for Jesus and the people with him. In was the custom when guests arrived for dinner to give them a refreshing foot bath. Then they either sat at a table, or lay propped up on couches surrounding a central food table. 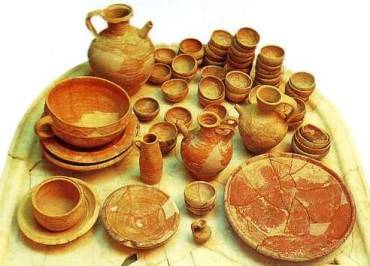 People always ate from a communal platter, which contained the main dish. There might be small side dishes. It was essential to wash themselves before eating, because they ate with their fingers from the one plate – knives and forks were not used, and food was scooped up with a piece of bread (see John 13:26). Depending on the circumstances, women and men might share a meal, sitting together. Because they prepared the food, women also brought the food to the table, as Martha did in this story. Martha served at the meal. ‘Six days before the Passover Jesus came to Bethany, the home of Lazarus, whom he had raised from the dead. There they gave a dinner for him. Martha served, and Lazarus was one of those at the table with him. Why is the anointing with oil so important? The story of the dinner, as told by John, is set on a Sunday evening, when members of the early Christian communities met to share a eucharistic celebration. This was no accident. John, writing circa 100AD, used several levels of meaning in the story. At the first level, Martha ‘served’ at the meal. But on a second level of meaning Martha was acting as a deacon at a eucharistic celebration. The word ‘served’ in Greek was diakonein; it was the term used for deacons in the early Christian church. This word was used in both stories about Martha and Mary, in Luke’s and John’s gospels. During the meal, Mary took a container of oil of nard (oil extracted from a balsam tree), broke it, and anointed Jesus’ feet with the expensive perfume. Then she wiped his feet with her hair. 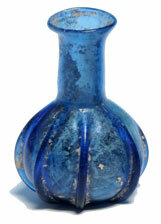 Anointing with oil has always had deep religious significance. Even today it is performed at the coronation of a monarch. In the Jewish world, it was a symbolic action which announced that the person anointed was especially favored by God. In the Old Testament, prophets anointed future kings, for example, Samuel anointed the future King David. When Mary anointed Jesus, she may have been anointing him as a king, the Messiah – Mark’s gospel hinted at this when it said that what she had done would always be remembered (Mark 14:3-0). 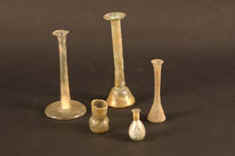 The apostle Judas, a close friend of Jesus, objected to the waste of money. He reasoned that the money should be given to people in need – and of course he had a point. Judas was particularly aware of the value of money because he was the organizer of the group who traveled with Jesus, in charge of the money that they carried with them. He paid for food and lodging from the contributions that wealthy supporters gave Jesus. In a bitter aside written long after Jesus’ death, the writer of John’s gospel suggests that Judas was not honest in this task. How did Jesus respond to Mary’s action? But Jesus defended Mary’s apparent extravagance. He knew he was in great danger, and that the path he meant to take might end in a terrible death. Being fully human he could not see into the future – this is one of the great mysteries of Christian faith about which theologians ponder. He was both fully human like us and so could not know the future, but he was also God and thus all-knowing. In any event, Jesus knew the probable consequences of the actions he planned. He had many enemies who would bring him down if they could. Mary also knew the danger that Jesus was in, and that he faced an ominous future. She offered her gift as a comfort and a reassurance to him, and perhaps as something more. She believed he was the Messiah, and the nard was her anointing oil. The role of women in the Christian church. At the time the gospels were recorded, the early Christians were arguing about what women could and could not do in the early Church. Should they be ministers? Should they be allowed to speak in public meetings? Should the traditional Jewish custom be followed, with ministry held by men only? Or might the Christian communities have priests and priestesses, as other ancient religions did? The truth of the Resurrection. Stories about Martha, Mary and Lazarus suggest that women’s testimony should be given equal weight with men’s. This was vitally important in the Christian story, since the first witnesses to the Resurrection had been women. Could they be trusted? Martha means ‘lady of the house’. Mary means ‘wise woman’ or ‘lady’; it is a Greek form of the Hebrew Miriam or Mariam. It was a popular name at the time of Jesus, perhaps because of the beautiful young Jewish princess Mariamme, married to King Herod the Great and murdered by him on a false charge of infidelity. Naming your child Mary or Miriam was a not-too-subtle protest against King Herod and what he had done. Should women work or stay at home? As far as the Jerusalemites were concerned, Jesus and his friends were a group of provincial dissidents from Galilee. Judas, on the other hand, was from Jerusalem. So what was he doing with Jesus? And why did he object to Mary anointing the feet of Jesus?